Even as our nation pulls out of the Paris Climate Accord, the local response to mitigating climate change has moved into high gear. It’s a fascinating time to be part of the energy transition to renewable energy. Here in Tompkins County, the agreed upon goal for the entire county is to cut greenhouse gas emissions by 80% by the year 2050. Nick Goldsmith, the Sustainability Coordinator for both the City and Town of Ithaca, takes his role in helping to implement this ambitious goal seriously. 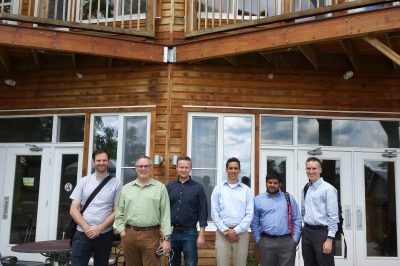 I was delighted when Nick invited Learn@EcoVillage to showcase the TREE neighborhood for a recent multi-city Peer Learning Exchange for Urban Sustainability Directors. 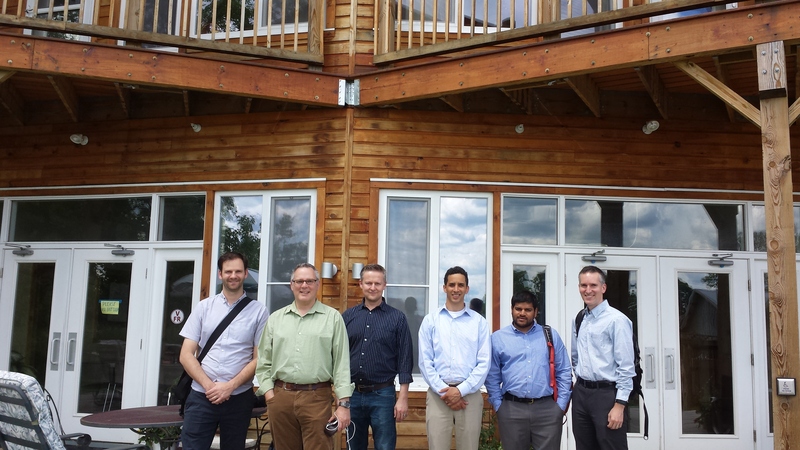 In June, the City and the Town of Ithaca hosted staff from the cities of Burlington, VT, Evanston, IL, and Fort Collins, CO for two days of meetings and events about green building policies, as part of a larger project studying the potential of local policies. On Thursday, June 8th, the group met for lunch on the beautiful outdoor patio of the TREE neighborhood at EcoVillage, followed by a 1.5 hour tour, as one of only two Ithaca field trips planned. The visitors were also interested to learn about the Pedestrian Neighborhood Zoning (PNZ) which we developed in conjunction with the County Planning Department as part of the EPA Climate Showcase Communities grant in 2013. The “floating zone” which can be applied in urban, suburban or rural areas, was written to make it easier to create pedestrian neighborhoods such as EcoVillage. Densely clustered neighborhoods are wonderfully social places where children can play safely and adults can enjoy connecting. The resulting sense of community allows people to reduce transportation because people can walk to their friends’ homes, work out of home offices, and share community meals. Meanwhile, Learn@EcoVillage hopes to work closely with the City and Town of Ithaca, and their consultants to support the Green Building Policy Project, which will examine policy tools to incentivize or mandate green building standards for new construction and major renovations. The GBPP will include looking at the broad array of existing standards, such as LEED, and the 2030 Challenge, as well as specific approaches such as using heat pumps for space and water heating, and reducing window-to-wall ratios. They will come up with recommendations on policy tools such as building and energy code, environmental review, revolving loan funds and other measures. Using a recent Park Foundation grant, Learn@EcoVillage will then help to share the resulting recommendations with the surrounding 14 towns outside of Ithaca through focus groups and training sessions with staff and planning boards. We’ll be working with the County Planning Department, and Taitem Engineering, and getting advice from the Tompkins County Council of Governments Energy Task Force. It feels good to be part of a robust local response to securing a safe and sensible energy future!